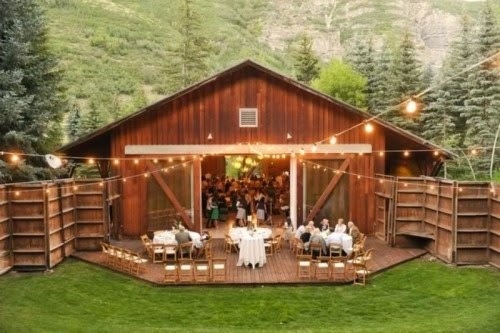 It is not easy to decorate a barn for your dream wedding and reception, but with careful planning and creative thought it can be romantic and lovely or country and rustic. There are barns in some areas that are actually built to accommodate weddings and receptions, dances and other social events. In most cases a barn needs tender loving care, creative minds and careful planning to be transformed into your dream wedding location. 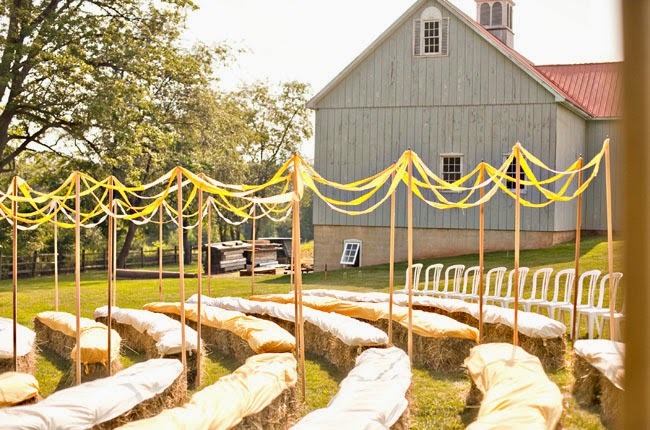 These tips and ideas are for you, so read on to see what you can find that will make your barn wedding just as the two of you want it to be. Since a barn is set in an outdoor setting that might be a field, a farmyard or grassy surroundings it is important to make sure that this is neat and as groomed as possible. 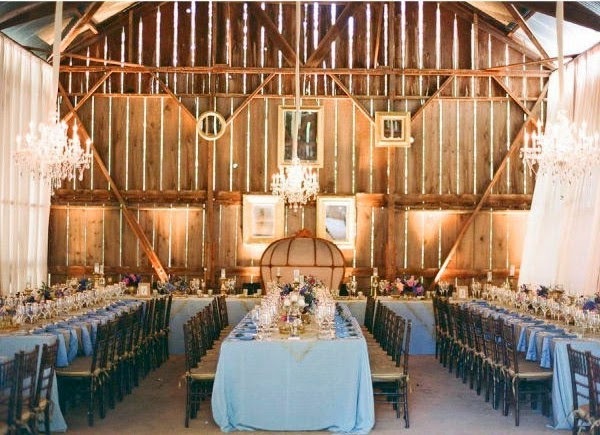 As most barns are not made for weddings it might require a clean-up before you can start to decorate. Clean walls, floors and window to remove dust and dirt. Be sure to check for loose nails, wood splinters anything else that could be a hazard to your wedding guests. You will need to know what or where restrooms are available if any and provide them if necessary. The other important thing is proper heating and cooling for the guests comfort. You will also want to have adequate outlets for lighting and if you are having musicians or a DJ they will also require electrical outlets. Check too, for adequate parking spaces for you and your guests. Corn stalks or bales of hay placed along the pathway to the barn makes it an inviting walk to the barn entrance. Also, the same stalks and bales placed at the entrance gives it a welcoming look as your guest go inside. Hanging curtains or drapes give a warm welcoming look to your entrance doors, too. It's not difficult to hang curtains or drapes on each side of the barn door entrance. The only thing is you must find ones that are long enough. You can cut lengths of fabric and hem each end. An option, is to buy regular curtains and then stitch a wide piece of ruffled lace or tulle across the bottom of each one to make it a longer length. It is likely you will not find a curtain rod long enough to go across a barn door opening, use a separate curtain rod for each curtain. Hang the rods on the inside of the door. Wild flowers growing around the barn or large bouquets of them placed nearby is another idea to consider. A fun idea is a truck load of hay and after the ceremony offer hay rides to the young and young-at-heart. They will usually be large open spaces and unpainted and in need of some tender loving care to transform them into a wedding venue. 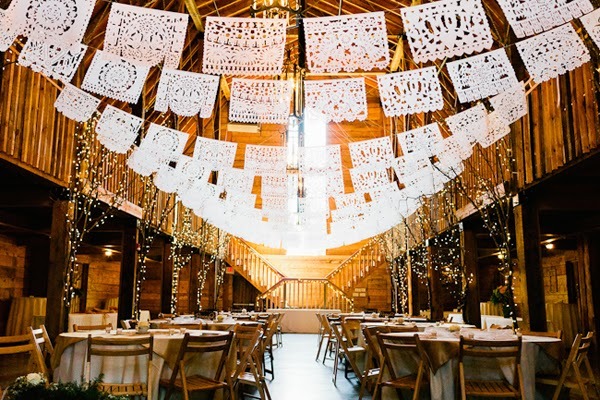 An idea you might use is to hang Mexican blankets, beautiful handmade quilts, Native American blankets or other fabrics that would complement your theme colors on the walls almost as artwork. Lean wagon wheels and other theme items along the walls or you can even hang them on the walls. For a wedding kind of look drape greenery and tulle around pillars, ledges or from beams. Other decorations that would fit beautifully into the theme and show a bit of a creative flare is to make a lasso into the shape of a heart or color horseshoes in you wedding theme colors and add to the wall decor. As you know barns are most often dark and drab if they are not lit properly. But you can make it dreamy with great lighting I suggest you use candles that are battery-operated and place them on window ledges and tables. Also, wrap rope lights or twinkle lights around pillars and along the barn beams. 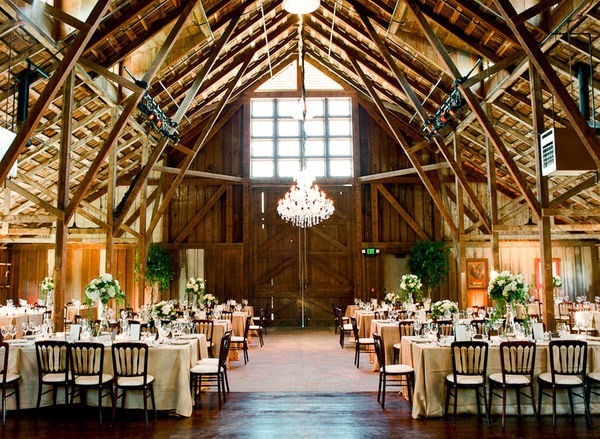 Hanging lanterns from the rafter beams also gives the barn setting a magical look. 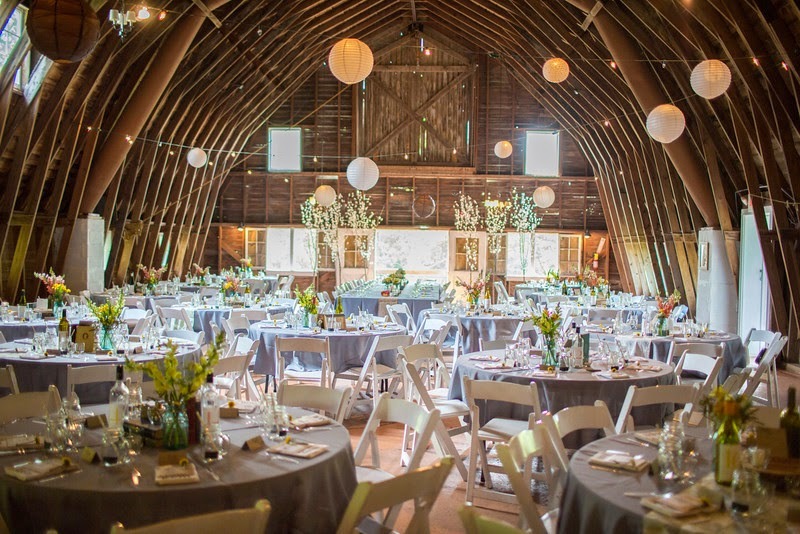 There may be restrictions on candles and things that have an open flame so be sure and clear this with the persons allowing you the use of the barn For a more elegant event couples have hung chandeliers from the ceiling. What a lovely and romantic look this gives.